Well, it hasn't been 80 degrees in Vermont recently, but it hasn't been freezing cold either. In fact, the road riding's been pretty decent. Even the dirt roads are riding well, which has been fun. I've been doing my best to get lots of base miles in and to seek out hills when and where I can find them. North Carolina training camp is coming up in two weeks. From what I here people down there have been riding hard for a while now. Hope I'm ready. I've also been spending a lot of time in front of the computer planning the race season, ordering equipment for the new race bike (details coming soon), and doing lots of interviews for MTBRacenews.com. 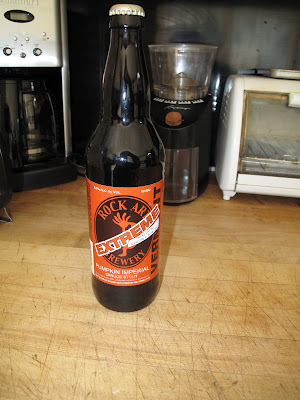 The weather has also been very conducive to one of my new favorite recovery drinks, Rock Art's seasonal Pumpkin Imperial Stout (which is brewed with pumpkin mash and spruce tips, yum).